When we last left off, the GT-Lite Project CRX was being loaded onto the big orange transporter and headed to the Detroit area and into the capable hands of SANLUIS Rassini. We’re about to take a trip into a place where absolute state-of-the-art hardware and software is used daily in the design and development of suspension systems used worldwide by most of the major OEMs. It’s a privilege to be able to work with these folks, and, as you’ll soon see, these guys also are very hands-on and fun to work with, too. Our team at Rassini includes Aftermarket Business Unit Manager Tony Berlingieri, (aka: “Goggles” Paisan), Engineering Technician Chris Galea, and Principal Engineer Jim Zeimet. One of the first things we did was put the car on the scales to see where we were starting. Since one of the goals of the program is to develop a lightweight suspension system, we need to know how much we weighed to begin with. With the existing engine and drivetrain in this car, the minimum allowed weight according to SCCA rules is 1895 lbs. With that in mind, we loaded 175 lbs of sandbags into the driver’s seat, and rolled her up onto the plates. We clocked in at 1880 lbs, with very little fuel in the tank. With more fuel and/or a heavier driver, we’d be right on target. Good to know. We weighed the car on a front to rear incline as well, so that we could determine the height and location of the Center of Gravity (CG). This is the FARO unit, ready for action. The handpiece, which looks like some kind of futuristic laser pistol (because that’s kind of what it really is) transmits a visible laser line which accurately determines the position of whatever you point it at. 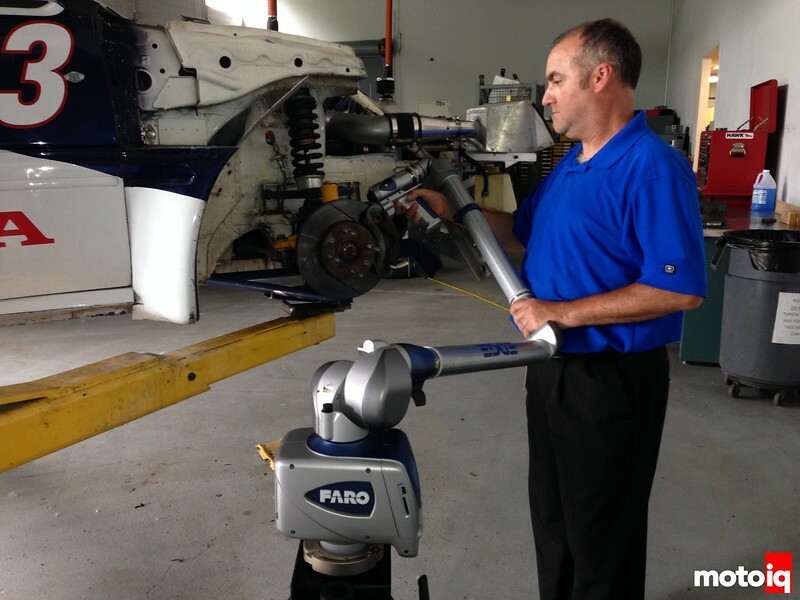 If the laser has a line-of-sight to a surface, it can determine the position of that surface in 3-D space with an accuracy of about .001.” If you can see it, the FARO can measure it! Keeping in mind that this car was very competitive, we’d like to know where all the magic came from. While driving talent and horsepower certainly factored into the success of this CRX, this car is known for its exceptional handling. 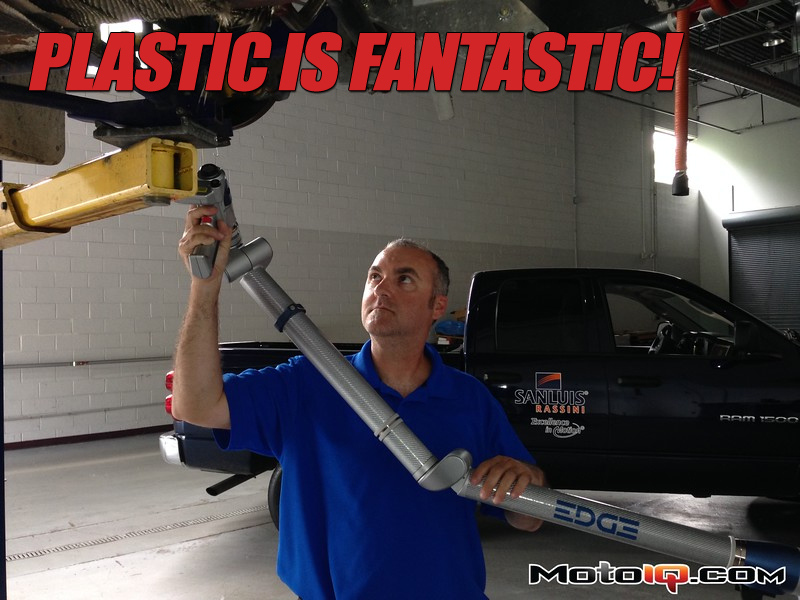 If you’ve read Mike’s Ultimate Guide to Suspension and Handling here on MotoIQ, you already know that proper suspension geometry is critical to handling performance. That being said, you have a few options available to analyze existing geometry. You can get out your plumb bobs, levels, tape measures, calipers, and graph paper, and start locating all the critical suspension mounting points, documenting wheel offsets, and lay out everything with detailed diagrams. It’s certainly an effective method, albeit not necessarily easy. We’re lucky – at SANLUIS Rassini they just get out the FARO FaroArm laser scanner. 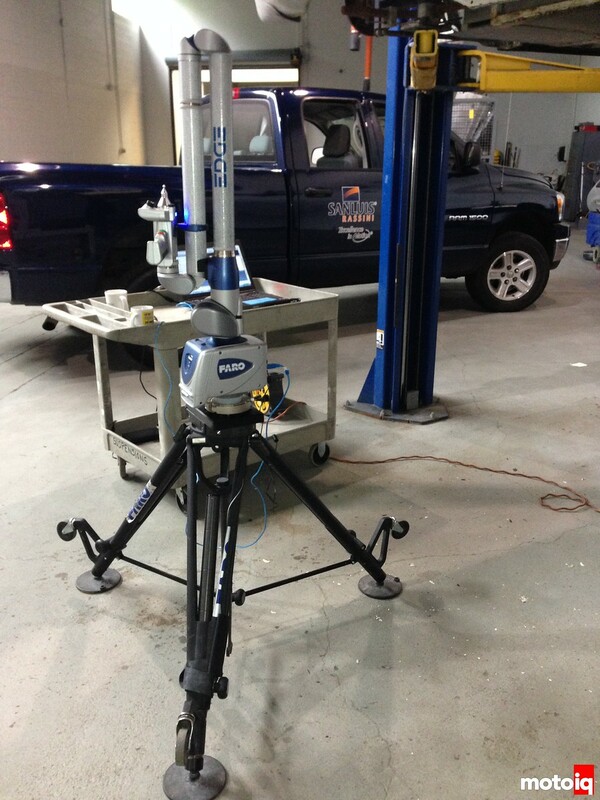 Chris Galea at SANLUIS Rassini measuring the front suspension geometry with the FARO. Basically, the unit creates a 3-D model of everything it sees, and it is important for the operator to not only know what to measure, but also to understand what information we want. It’s important to measure all the pivot points accurately and then tell the software what points are important. Since the scanner doesn’t see the actual center of a pivot or a spherical bearing, Chris has to tell the software to determine where those points are based on the geometry of the surrounding surface. 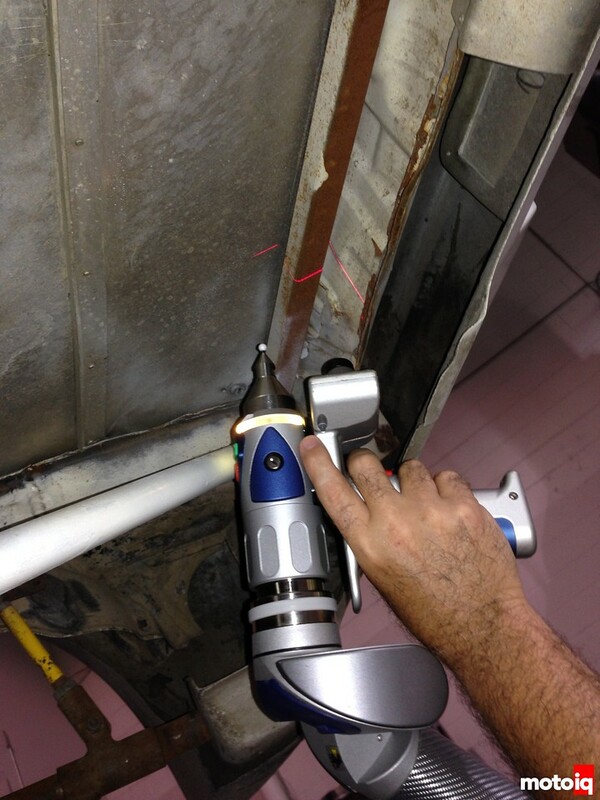 Here you can see the laser line that the FARO arm projects. We’re not only interested in the suspension geometry itself, but the frame and chassis geometry as well, so we know where we can and can’t place pickup points or reinforcements. Announcing GRAMLIGHTS 57XTREME CJ SPEC (Couleur Japanesque) Coming Soon!